Chef Sam Gowing prepares freshly caught, local tuna. I’ve been craving sashimi flat out. I’m like fish mad at the moment and it’s a tricky one because there are so many conflicting ideas about fish and where it is sourced – what’s best? Farmed and organic or wild and unknown? I actually called on the expertise of a few in the know to see what the real deal on fish is. Personally I think it comes down to two things – exactly where it is caught and by whom. Organic farmed or deep sea is my preference. I never eat imported fish, especially imported farmed fish! I asked my good friend Sam Gowing who is forever researching and picking growers brains and has her finger on the pulse when it comes to sustainable and optimal health and food as medicine. She’s ya gal if this spins your wheels! (Find her on Facebook or follow her on Insta @chefsamgowing). “Did you know that much of the fresh yellow fin tuna available in Melbourne and Sydney is caught off the continental shelf between Byron Bay and Coffs Harbour? The continental shelf of NSW and southernmost of the Solitary Islands is situated only 20 minutes by boat from the Coffs marina, and through the summer months in particular, the islands and their reefs create perfect conditions for yellowfin tuna (YFT), wahoo, kingfish, mackerel, sailfish and juvenile black marlin angling. Also available are Southern Bluefin Tuna are ranched in the clean waters of lower Spencer Gulf SA where they have naturally roamed due to optimum environmental conditions. Located near the regional centre of Port Lincoln, it a prime location for ranching tuna due to availability of a skilled workforce, infrastructure and transport networks. I think it’s most important to feel satisfied that you are making good choices and nobody can actually tell you whats right for you – so with that in mind, next time you buy your fish, just make sure you’re thoughtful of where it was sourced to know you’re doing what you believe to be best for your family. 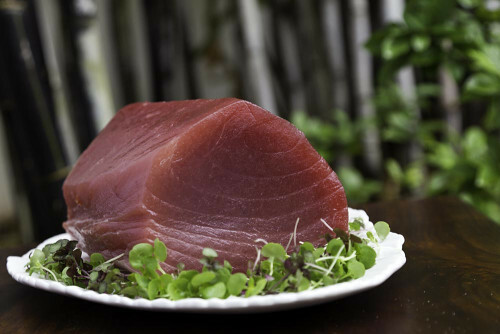 Now… Seared Tuna and Warm Green Salad! 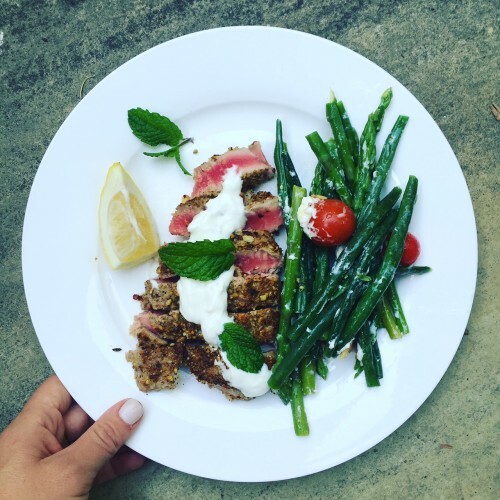 Prepare tuna steaks by patting and pressing a generous amount of dukka on both sides. String and clean the beans and asparagus and place into rapidly boiling water for approx 5 minutes. Melt coconut butter in pan and allow pan to get hot. When ready, place in tuna. For medium cooked tuna, allow to cook for approx 4-5 minutes and turn. Whilst tuna is cooking add cherry tomatoes, mint and feta. Dress with a drizzle of oil and a little lemon, salt and pepper. To serve, place warm green salad on plate, slice tuna and serve with a dollop of yoghurt and lemon wedge.